Early warning is vital to escape a burning house. Fire emergency is a situation no one wants to face, but firefighters fight thousands of home fires every year. That is why every home in Australia must have properly installed smoke alarms. With the different types of smoke alarms in the market, it is difficult to identify which one your home needs. These three simple steps will help you decide. First step: Identify the types of smoke alarms and ensure it is photoelectrical. These alarms contain LED light that sends a straight beam across the chamber. There is a light sensor on the other side of the chamber. Once the smoke enters the detector, it will disrupt the light beam. The beam will then go off to separate directions, with some of the LED lights hitting the sensor. Once the light hits the sensor, it will trigger the alarms. Photoelectric smoke alarms are best at identifying a common type of home fire, such as smoky and smouldering fires, the alarm can cause false alarms, so they must occasionally be cleaned. Photoelectric smoke alarms are the best type for homes, as recommended by most fire authorities. Photoelectric smoke alarms are found to be much faster at detecting smoke from smouldering artificial materials than the obsolete ionisation alarms. Early warning is essential The longer the fire goes on, the more smoke can occupy the home and become an inhalation and visibility hazard. Ensure the alarm complies with the Australian Standard for smoke alarms, AS 3786, as required by law. Strange as it sounds, different states have different rules on this. For a Queensland property, Queensland, newly installed smoke alarms must follow the new version of the standard, AS 3786:2014. Because of this confusion, it is still possible to buy the obsolete alarms in Qld, so check very carefully if you are making this purchase yourself. How are Qld requirements different? 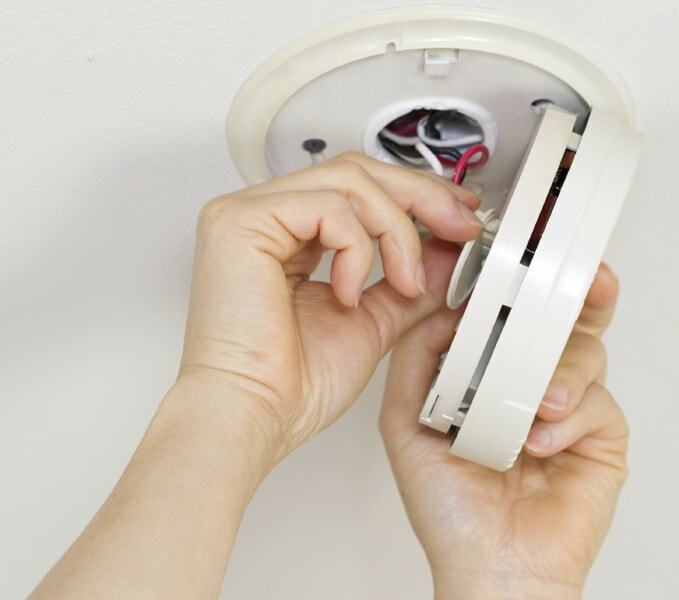 Only photoelectric smoke alarms can be installed when a smoke alarm is replaced or installed. Smoke alarms must be replaced within ten years of their manufacture date or if found to be faulty when tested. Substantial renovation applications that are submitted on or after January 1, 2017, will require a smoke alarm to be installed in each bedroom of the dwelling.• All smoke alarms installed as of this year must be either hardwired to the dwelling’s electricity supply or powered by a non-removable battery with a 10-year battery life. Soon, all smoke alarms must be interconnected to every other smoke alarm installed in the dwelling. Soon, each story with at least one bedroom to have a smoke alarm installed in each bedroom. If one or more of the bedrooms are connected by a door to a hallway, a smoke alarm must also be installed in the hallway. Test button that lets you check if the alarm is working. This minimises the need to climb a ladder or reach up with a broom handle to press a button – especially suitable for high ceilings or if you’re not very mobile. Battery-powered models should monitor their battery level and warn you when the battery needs changing by beeping every few seconds. For people with hearing problems, there are alarms available, such ultra-loud alarms, strobe lights, and vibrating pads for your bed.